Like carbon atoms surrounding us on earth. As coal deposits with utility and worth. Like dazzling diamonds, most precious since their birth. All carbon, all related, but not the same. Each path, its length and its direction. The benefit of the path selection. To walk the strait path of perfection. All are good but wisdom is man’s best aim. The major obstacle to overcome. Causes too many people to succumb. Prevent that which one might have become. All evils shun wisdom, equally to blame. Proverbs tells all good things are not the same. Wisdom, of all, is worthy of acclaim. The twenty-first century has brought us a world where knowledge of almost any topic is at our fingertips. A ubiquitous store of information is available to anyone who has access to a computer or a smart phone. This almost limitless accumulation of facts should mean that mankind would make better choices and be better people than in the past. That does not appear to be the case. You can read thousands of books or spend all of your free time Googling but that does not mean that you will make wise choices. There are millions of very intelligent people on earth. They have the ability to understand the knowledge that is around them. They are learned and are able to determine how separate facts relate to one another. With so many intelligent people on earth, mankind should be able to make better choices and be better people than in the past. That does not appear to be the case. You can be incredibly intelligent and have multiple degrees from renowned universities but that does not mean that you will make wise choices. Those who are wise choose the correct information that will achieve the best result for all and then properly use that information to govern their lives. Wisdom does not come from having the most information or being the smartest. Wisdom comes from avoiding the traps that ensnare most knowledgeable, intelligent people. The wise are not seduced by the sophistries of society and their own agendas and egos. They, instead, focus on the best answers to the problems that face mankind. Consider the powerful and intelligent people who have destroyed their reputations, and the lives of others, by making unwise choices. In recent history those names would include Bernie Madoff, Richard Nixon, Jeff Skilling, Bill Clinton, Dennis Koslowski, Jerry Sandusky, and the list goes on. Wisdom only comes to those who can successfully abstain from egotism, lust for power and riches and unchecked physical appetites. These three evils have disgraced powerful men and women since the dawn of civilization. These same evils also damage those of us who are less knowledgeable and intelligent. Pride and ego continue to plague even those who can control the other two evils. It is insidious because everyone wants to feel good about themselves and what they are doing. The downfall of the egotist comes from two sources. First, they become more concerned about appearing intelligent and sophisticated rather than standing for that which is right. Second, they make choices that are politically correct rather than actually correct. The morality of Hollywood, political agendas and the philosophies of misguided men and women are taking a toll on the wisdom of even the best people. Pride and ego make them believe and advocate ideas that appeal to the intellect but reject wisdom. Remember, just because the news reports, “A study shows…” does not mean that the conclusion of the commentator is correct. While satisfying our egos with intellectualism and elitism makes us feel important, being wise will make us happier. 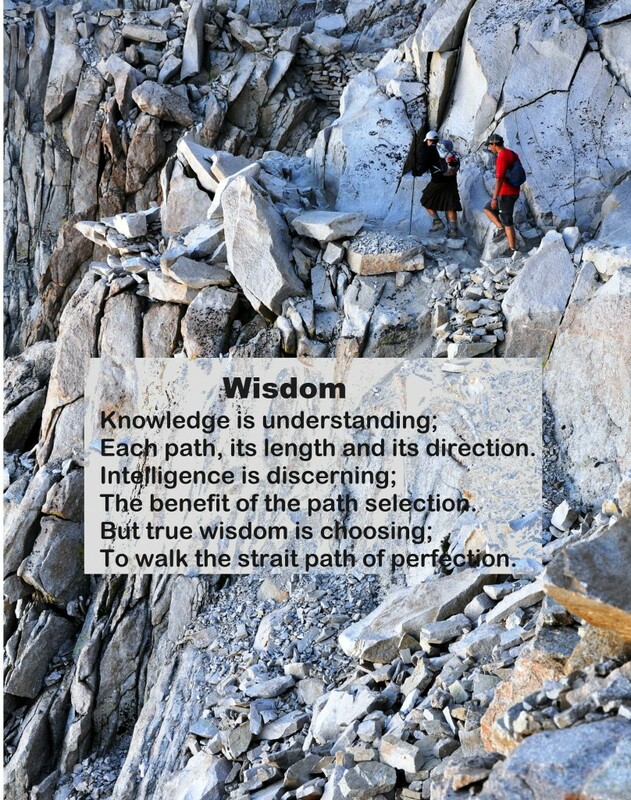 Making wise choices will also benefit those within our sphere of influence. Most of all, being wise is the best thing we can do for our children and the generations that follow.